Milestone > blog > Design a Backyard That’s Perfect for a Rocking Party! What good is a back yard if you can’t enjoy it with our family and friends? There are few things in life that can compare to creating lasting memories. 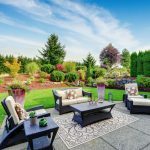 Whether you are looking to throw a rocking party for the neighborhood, host an intimate dinner party for a few close friends, or simply want to create a space that will be enjoyed by your family for generations to come, your backyard can serve as a pivotal space for all of your outdoor entertaining. Here are a few tips to ensure that your backyard is certain to become the envy of the neighborhood! First and foremost your backyard should feel like an oasis away from the frustrations and stresses of life. Create a landscape that is soothing and relaxing. Keep in mind that your backyard is more than just the lush plants and flowers you choose to incorporate. You can get creative! Vertical gardens offer a stunning visual effect that will also serve as a great conversational piece. Custom water features and fountains not only add the soothing sight and sound water, but they also work to enhance your space. Be sure to add some of your favorite artifacts and unique benches to place the finishing touch on your little slice of paradise. From Japanese Zen inspired gardens to modern minimalist gardens, you can create a space that speaks to your personal tastes and vibrant personality. Everyone loves gathering around a fire pit! A custom-built fire pit can serve as a focal point, creating a distinct area in your backyard while simultaneously lending a little warmth. For example, a patio provides a nice place for friends and family to gather outside and spend time together. Unfortunately, a patio can also be aesthetically boring. Even when it’s textured, a flat surface is still a flat surface. Adding a fire pit to your patio is like adding a centerpiece on your dining room table. A fire pit breaks up the monotonous flat, injects depth, and makes the surface area much more interesting, especially when you’ve got a fire burning! You can take this love of fire pits to the next level by incorporating a fire wall to your outdoor living space. A custom built fire wall takes that traditional fire pit to the next level! The firewall is a self-contained unit that can provide more heat than a traditional fire pit. It can be designed in any shape or form. They are truly unique and will help to keep your party going long into the night! Check out a few of my favorites below. Take a Plunge in Your Pool! What better way to keep the party going on a hot day than by taking a dip in your pool? Regardless of the size of your backyard there is a pool design out there waiting for you! Take it up a notch with an awe inspiring infinity pool, that effortlessly extends into a limitless horizon. Limited on space, a plunge pool provides a space saving alternative that also keep you cool and refreshed. Take a look at some of our favorite designs below. Each was designed to fit into the lifestyle and space for the client. A backyard pool is a sure fire way to create a rocking party! In the Mediterranean, it’s very normal to see families cooking outdoors. 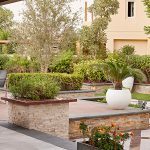 Today, this style of outdoor cooking has become a popular trend in Dubai. Homeowners are experiencing the delights of using their outdoor kitchens and barbecues in their own backyards. One benefit of having an outdoor kitchen is that they’re perfect spaces for entertaining! When food is cooked out on the patio, guests can gather around the grill and socialize as dinner is being prepared (and later served). It might get crowded in an indoor kitchen when everyone hangs out with the chef, but outside there’s so much more space! Additionally, you can increase the comfort for your party guests by adding outdoor furnishings, custom mood lighting, and great music. After all, a great meal is a key element to creating a rocking party for your guests! 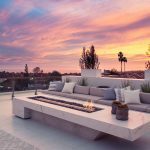 Perhaps one of the most important features for outdoor entertaining is to provide a comfortable space for your guests to relax and enjoy the comforts of your spectacular outdoor living space. Shaded areas with comfortable and unique furniture provide the perfect retreat from the heat and inclement weather so that the party never has to end! Gazebos and pergolas can be accented with lights, plants, and your favorite accent pieces to add to their ambiance. Be sure to use elements that you love, incorporating special pieces that mean something to you. Items that you pick up along your travels always work well to create a personal space that reminds you of your past adventures. These unique items will have you loving your space even more! Shop your own home or head out to your favorite local shop for items that not only speak to you and look cool, but serve a purpose as well. As you create your outdoor entertaining oasis, remember that this is your space! This is the area that you and your family will enjoy, creating lasting memories for years to come. So let’s get the rocking party started! If you ever need any tips, leave a comment below!